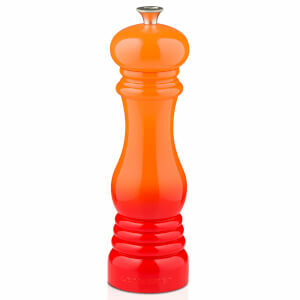 The Le Creuset Classic Salt Mill will add an elegant accent to your kitchen or dining room. Strong and durable, the salt mill features a metal knob embossed with a ‘S’ and has a fully adjustable ceramic grinder to offer a coarse or fine grind. Made from superior quality ABS, the strong and durable mill is the perfect gift for all foodies, bakers and chefs.